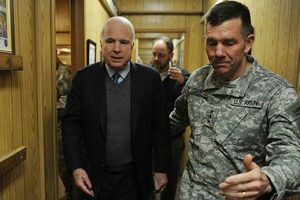 Sen. John McCain walks with Lt. Gen. William Caldwell at Camp Eggers in Kabul, Afghanistan on January 6, 2009. The U.S. Army illegally ordered a team of soldiers specializing in “psychological operations” to manipulate visiting American senators into providing more troops and funding for the war, Rolling Stone has learned – and when an officer tried to stop the operation, he was railroaded by military investigators. The orders came from the command of Lt. Gen. William Caldwell, a three-star general in charge of training Afghan troops – the linchpin of U.S. strategy in the war. Over a four-month period last year, a military cell devoted to what is known as “information operations” at Camp Eggers in Kabul was repeatedly pressured to target visiting senators and other VIPs who met with Caldwell. When the unit resisted the order, arguing that it violated U.S. laws prohibiting the use of propaganda against American citizens, it was subjected to a campaign of retaliation. The list of targeted visitors was long, according to interviews with members of the IO team and internal documents obtained by Rolling Stone. Those singled out in the campaign included senators John McCain, Joe Lieberman, Jack Reed, Al Franken and Carl Levin; Rep. Steve Israel of the House Appropriations Committee; Adm. Mike Mullen of the Joint Chiefs of Staff; the Czech ambassador to Afghanistan; the German interior minister, and a host of influential think-tank analysts. At a minimum, the use of the IO team against U.S. senators was a misuse of vital resources designed to combat the enemy; it cost American taxpayers roughly $6 million to deploy Holmes and his team in Afghanistan for a year. But Caldwell seemed more eager to advance his own career than to defeat the Taliban. “We called it Operation Fourth Star,” says Holmes. “Caldwell seemed far more focused on the Americans and the funding stream than he was on the Afghans. We were there to teach and train the Afghans. But for the first four months it was all about the U.S. Later he even started talking about targeting the NATO populations.” At one point, according to Holmes, Caldwell wanted to break up the IO team and give each general on his staff their own personal spokesperson with psy-ops training. Under duress, Holmes and his team provided Caldwell with background assessments on the visiting senators, and helped prep the general for his high-profile encounters. But according to members of his unit, Holmes did his best to resist the orders. Holmes believed that using his team to target American civilians violated the Smith-Mundt Act of 1948, which was passed by Congress to prevent the State Department from using Soviet-style propaganda techniques on U.S. citizens. But when Holmes brought his concerns to Col. Gregory Breazile, the spokesperson for the Afghan training mission run by Caldwell, the discussion ended in a screaming match. “It’s not illegal if I say it isn’t!” Holmes recalls Breazile shouting. In March 2010, Breazile issued a written order that “directly tasked” Holmes to conduct an IO campaign against “all DV visits” – short for “distinguished visitor.” The team was also instructed to “prepare the context and develop the prep package for each visit.” In case the order wasn’t clear enough, Breazile added that the new instructions were to “take priority over all other duties.” Instead of fighting the Taliban, Holmes and his team were now responsible for using their training to win the hearts and minds of John McCain and Al Franken. In a statement to Rolling Stone, a spokesman for Caldwell “categorically denies the assertion that the command used an Information Operations Cell to influence Distinguished Visitors.” But after Scott offered his legal opinion, the order was rewritten to stipulate that the IO unit should only use publicly available records to create profiles of U.S. visitors. Based on the narrower definition of the order, Holmes and his team believed the incident was behind them. Both Holmes and Levine maintain that there was nothing inappropriate about their relationship, and said they were waiting until after they left Afghanistan to start their own business. They and other members of the team also say that they had been given permission to go off post in civilian clothes. As for Facebook, Caldwell’s command had aggressively encouraged its officers to the use the site as part of a social-networking initiative – and Holmes ranked only 15th among the biggest users. Nor was Holmes the only one who wrote silly things online. Col. Breazile’s Facebook page, for example, is spotted with similar kinds of nonsense, including multiple references to drinking alcohol, and a photo of a warning inside a Port-o-John mocking Afghans – “In case any of you forgot that you are supposed to sit on the toilet and not stand on it and squat. It’s a safety issue. We don’t want you to fall in or miss your target.” Breazile now serves at the Joint Chiefs of Staff, where he works in the office dedicated to waging a global information war for the Pentagon. After being reprimanded, Holmes and his team were essentially ignored for the rest of their tours in Afghanistan. But on June 15th, the entire Afghan training mission received a surprising memo from Col. Buche, Caldwell’s chief of staff. “Effective immediately,” the memo read, “the engagement in information operations by personnel assigned to the NATO Training Mission-Afghanistan and Combined Security Transition Command-Afghanistan is strictly prohibited.” From now on, the memo added, the “information operation cell” would be referred to as the “Information Engagement cell.” The IE’s mission? “This cell will engage in activities for the sole purpose of informing and educating U.S., Afghan and international audiences….” The memo declared, in short, that those who had trained in psy-ops and other forms of propaganda would now officially be working as public relations experts – targeting a worldwide audience. As for the operation targeting U.S. senators, there is no way to tell what, if any, influence it had on American policy. What is clear is that in January 2011, Caldwell’s command asked the Obama administration for another $2 billion to train an additional 70,000 Afghan troops – an initiative that will already cost U.S. taxpayers more than $11 billion this year. Among the biggest boosters in Washington to give Caldwell the additional money? Sen. Carl Levin, one of the senators whom Holmes had been ordered to target.